It's been ages since my last seascape shoot. I don't know why this is. It's probably the weather (winter just past), lack of inspiration / interest, no new places to explore, no new gear or just plain lazy. Thus, I'm thankful to a friend (Ryan) who invited me to shoot at Turimetta one sunrise. I've been shooting at Turimetta so many times that I know where to position. I don't 'spray' my camera anymore hoping I get the perfect shot. I just look at the scene, evaluate it and decide if I'll take the photo or not. If it's really bad, I don't shoot. If it's medicore, I might not take it as well. If it's already amazing, then I shoot it. No, I'm not being conservative on using my camera or shutter count. I just want to train my eye to see beautiful composition. 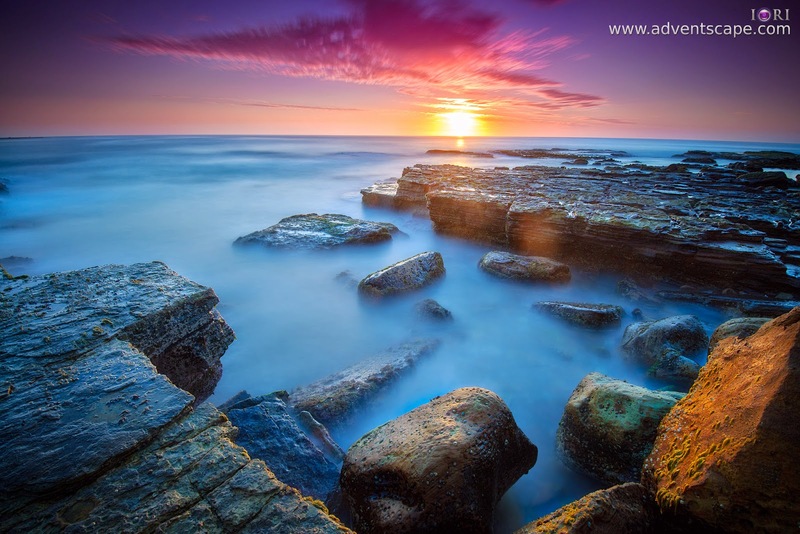 The photo was taken at Turimetta Beach at Narrabeen. I arrived pretty late, again. But I still arrived before the actual 'red sunrise' (where the clouds turn red). My selected location was already taken by earlier photographers so I just went by walking. I arrived at the edges of the rocks and decided to shoot there. This is a long exposure photo on a tripod. I used 3 filters to control the brightness of the sky and lengthen the exposure time. I also used a timer since it's beyond 30 seconds. The photo is already saturated. I just bumped the saturation a bit in photoshop using vibrance. I then add an S-curve to increase contrast. The sun is already blown out - I don't bother pulling in details. There were no cloning - all rocks as is. The photo already has a vignette, I didn't add / increase it.